I travel quite a bit with my kids and have gotten used to expecting a certain type of hotel when I stay with certain brands. I know what to book for a quick night stay and what hotels have amenities that will keep us busy for a week at a time. Every once in a while, I come across a hotel that defies my conception of its brand. Sometimes in a good way and sometimes not. What I found at the Residence Inn Muskoka Wharf was not necessarily a complete departure from the Residence Inn brand but instead a hotel representing its brand in what has to be the most beautiful setting of any Residence Inn in North America if not the world. 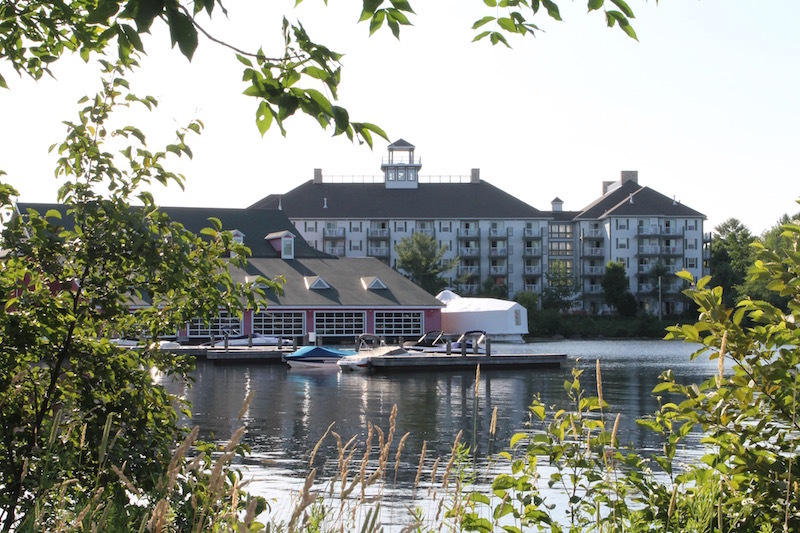 When you step into Residence Inn Muskoka Wharf, you will recognize a lot of the best aspects of the brand. When you look out of it, you won’t believe what you see. Named a top destination again and again by National Geographic, Muskoka is a Canadian treasure. Just ask the hoards of Torontonians who drive down weekend after weekend year round. Although we have spent a significant amount of time in Muskoka, until recently I had not heard of Muskoka Wharf. 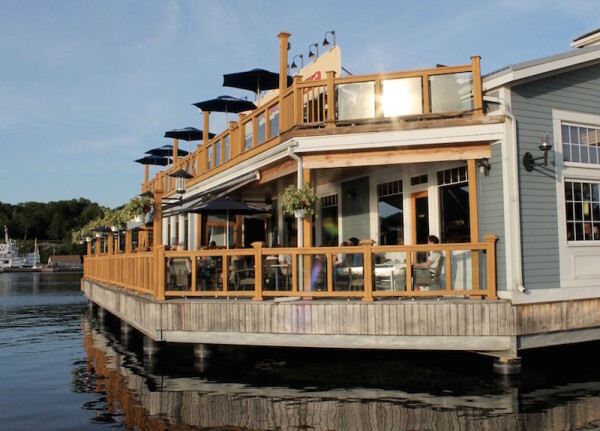 Located in Gravenhurst, Ontario, about 2 hours from Toronto, Muskoka Wharf is a relatively new development that still manages to be steeped in Ontario history. Built as a small and very walkable community, we loved strolling the boardwalk along the lake, shopping, checking out the restaurants and heading to the very fun steamboat themed playground. 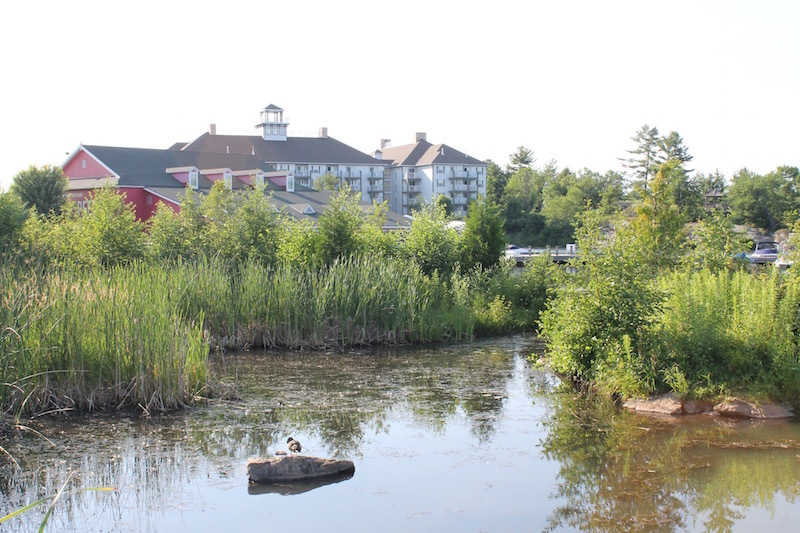 The development which cost over $170 million to build is also home to luxury condominiums, public docks, the Muskoka Boat and Heritage Centre and plenty more. Most notably, the Muskoka Wharf is the home port to the RMS Segwun, Wenonah II, and Wanda II. The most famous of the three, the RMS Segwun, was originally charged with delivering passengers and mail throughout Muskoka in 1887. By 1958, it was decommissioned and in 1962 turned into a floating maritime museum. 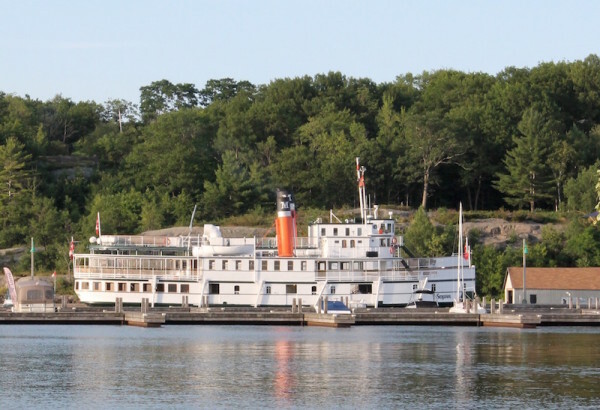 Soon, the Muskoka Steamship & Historical Society began working to re-launch the ship which happened in 1974. The Segwun still holds her status as the official Royal Mail Ship. 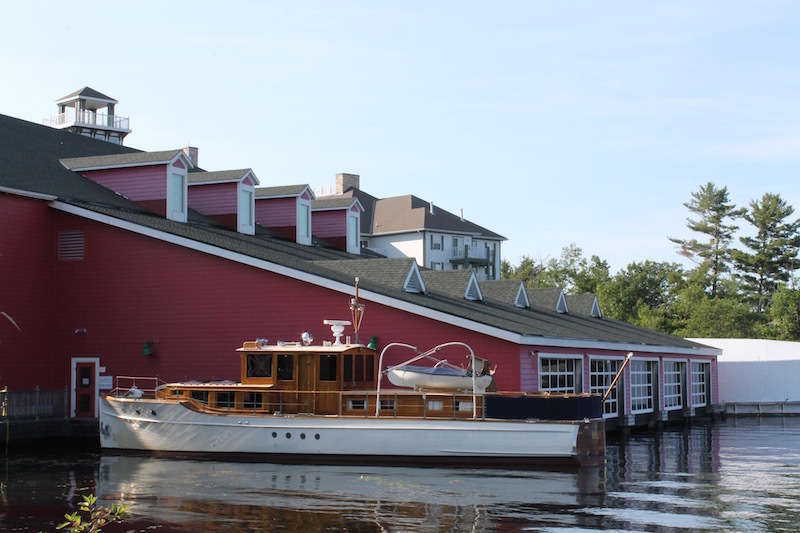 The best part is now visitors to Muskoka Wharf can cruise aboard what has to be the most photographed boat in all of the Muskokas. I headed to the Residence Inn Muskoka Wharf with not only my two kids but another solo mom and her two kids. I had looked at the website and decided that the 2 bedroom suites where the perfect set up for a solo mom sleepover. We spent the day visiting Santa’s Village and then headed to the hotel for some rest and relaxation. Check in was easy and the hotel has a huge free parking lot. As we headed upstairs, we passed through a hallway of windows that had the most incredible view I had ever seen from a Residence Inn. The surprises continued as we enter the room and headed out to the balcony which overlooked the lake. The hotel itself still looks new and is kept incredibly clean. 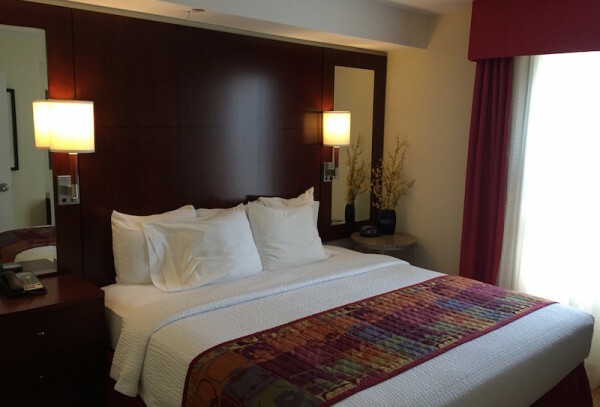 The rooms include kitchens and as with all Residence Inns, there is a complimentary breakfast buffet each morning. The hotel has a great indoor pool with doors leading out to a gorgeous sitting area with a nice fire pit and huge barbecue. I wasn’t sure about the indoor pool in summer but found it nice for the kids to be able to play at night without worrying too much about the dreaded mosquitos that tend to come out at night in Muskoka. All in all, I was really impressed with the hotel and the price point of the hotel. The room was large enough for 6 to sleep comfortably with lots of room for me and my friend Ashley to sit and enjoy a glass of wine on the balcony while the kids played inside. There were two sizeable bathrooms, two ensuite bathrooms and a large kitchen and sitting room. Muskoka Boat and Heritage Centre: Literally steps from the hotel, the Muskoka Boat and Heritage Centre is a historic look at steamships and life in the Muskokas. For kids, there is also a really great Kids Zone with pirate activities, building challenges and the chance to try a float plane simulator. Steamship Cruises: A number of steamship cruises depart daily out of Muskoka Wharf. 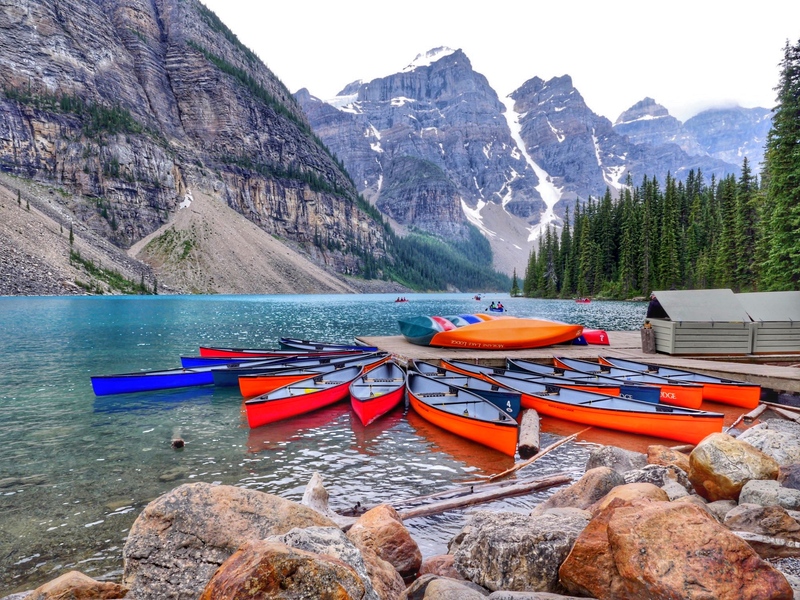 These range from 1 hour long cruises to extended brunches that take you along the shores of the lake to see some of the nicest cottages and homes in the area. 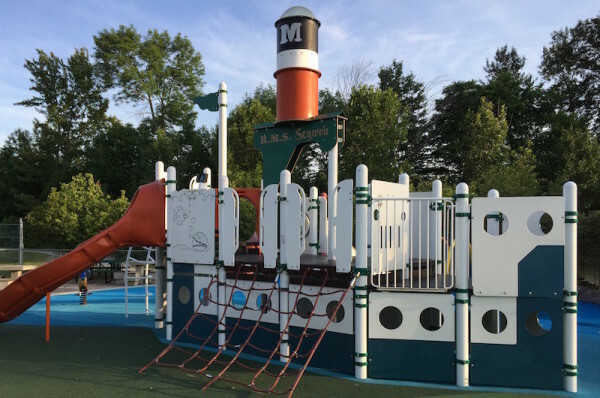 Throughout the summer there are a variety of kids’ cruises with themes like Frozen guest starring Anna and Elsa, Pirate Cruises and Noah’s Ark cruises complete with animal visitors. Eat Ice Cream: In the parking lot of the Residence Inn, there is a very cute ice cream shack which lines up at night. Everything we tried was delicious. Rent a Boat or Jet Skis: If you have a boating license, Muskoka Wharf has a good selection of boats and jet skis available. There are plenty of opportunities for kayaking as well. Hit the Park: Steps from the hotel, there is a sizeable park with a steamship themed playground, splash pad and baseball fields. Try Local Goods: Muskoka Wharf is home to the the Gravenhurst Farmer’s Market and you won’t want to miss it. Every Wednesday from 9:00 am – 2:00 pm farmers gather with tourists, locals and other food suppliers for the Farmer’s Market. Try the Ontario peaches and strawberries in summer. Shop and Eat: Muskoka Wharf is home to a number of restaurants, some which sit directly on the water. They range from fine food like Dock of the Bay to Canadian chain Boston Pizza which must win an award for the best Boston Pizza patio in all of Canada. The Residence Inn Muskoka Wharf is 15 minutes away from Santa’s Village and a perfect alternative if you are not interested in trying their camp sites. We found the drive easy and it was nice to break away at the end of the day and have a fun and peaceful night in an entirely different area. I would recommend staying at the hotel again and again if you want to take your kids to Santa’s Village for a day or two. We truly enjoyed our time at the Residence Inn Muskoka Wharf and I can advise that its a wonderful place for families. I loved that we were able to park our cars and the kids had plenty of space to run and explore away from roads. We loved chatting with the fisherman who showed us their daily catch, checking out the Steamships and seeing the museum. 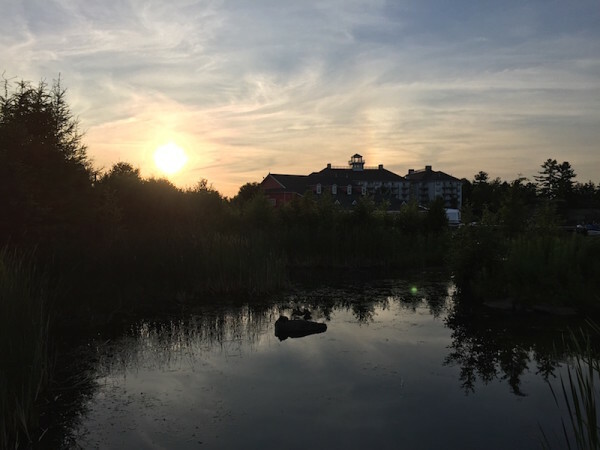 You won’t get a better hotel for the price with a view and natural surroundings like what we found at the Residence Inn Muskoka Wharf. What a great review. I appreciate how you added tips on places to go with kids. 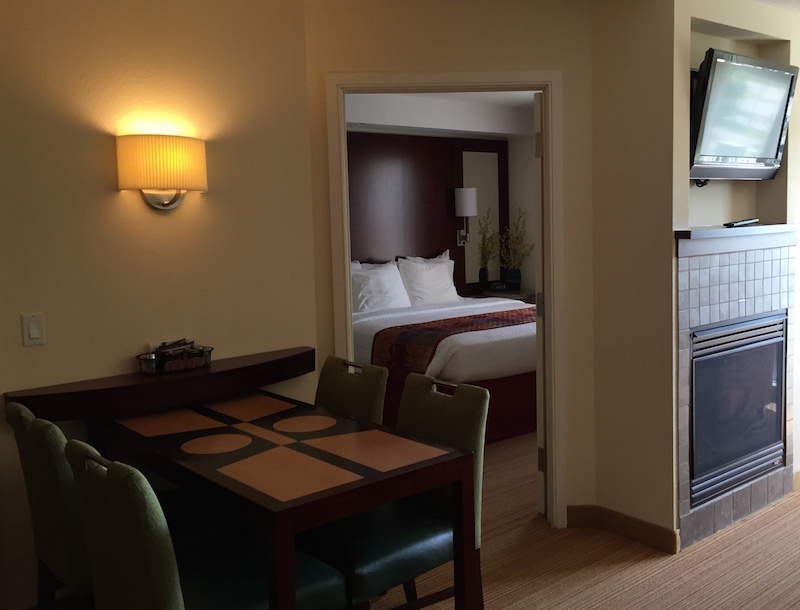 I prefer staying at a hotel, rather than a cottage so its nice to know that you can get a two bedroom suite. Plenty of room it looks like. I’ve not yet been to Muskoka, but your post certainly makes me want to go there. 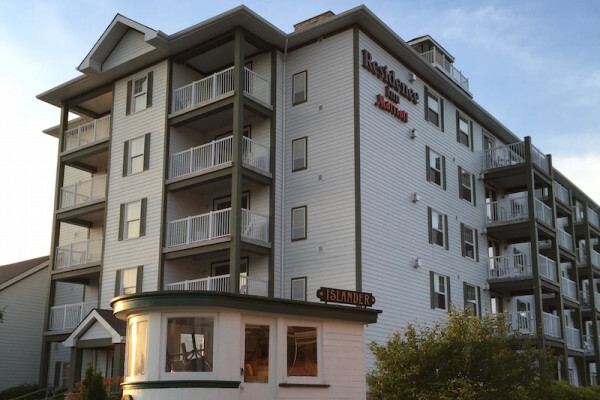 The residence Inn looks lovely! I think this would be a fantastic destination. I’d probably go for a steamship cruise – kind of like a train but on water.